Excellent service, very friendly and clear communication. Everything was moved on time quickly and with care. Oleg and his team go above and beyond that which is asked from them. Highly recommend! We used London Removals for our move from North London to North Herts in October. 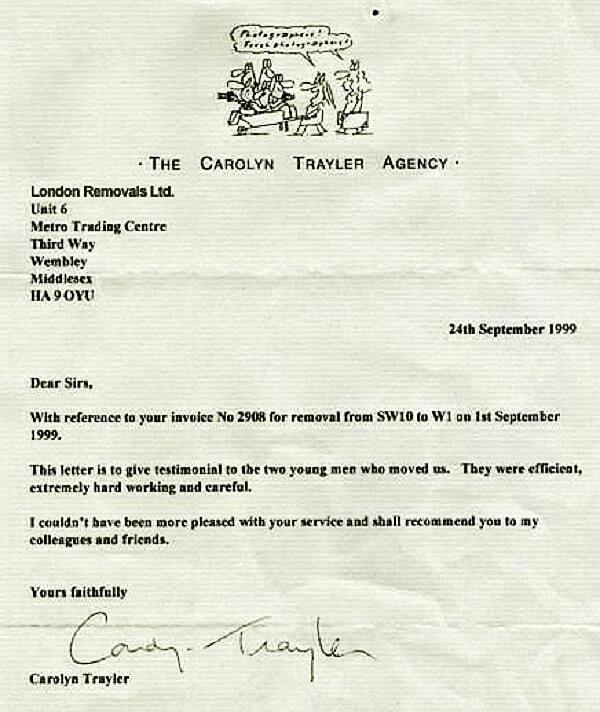 The service we received was excellent from the first enquiries made to the move itself. Steve was always available to speak to and really helped take the stress out when we had to change the date of the move. The removal team were professional and really took care of our belongings. I was so impressed at the speed they worked to empty our old house and to get everything in place at the other end. Nothing was a problem for them. I can't recommend them highly enough and would certainly use their services again if we needed to. Really friendly guys who were very careful with our belongings. We opted for them to pack and move us and they did a great job. Have recommended to friends and family! London Removals have provided a personal yet professional removals and storage services, at competitive prices. The staff were friendly and on hand to help out with any queries. They were very understanding of my difficult circumstances regarding removals at short notice. I would like to thank all the staff members, especially Steve and Kino. I highly recommend using their services. Thank you very much for making my move (with a 'thousand books' - or near enough) absolutely seamless! Very efficient, professional, and thoroughly pleasant service, from the first phone call to the final wave. My flat was full of awkward stuff - alongside the abovementioned books, plus clothes and shoes, there were glass candle-holders, crystal decanters, tiny port sippers, ten bottles of wine, framed sketches, mirrors, guitars - you name it... Everything was packed up carefully and efficiently; the team worked quietly and diligently packing and moving out of the old home and into the new one. The whole thing was as stress-free as it could be. Thank you so much all! I strongly recommended this company because of excellent communication, punctual and professional service, and friendly staff! This is the best removing service out of the three I had so far and will definitely stick with them next time! Absolutely Amazing could not fault the guys who moved us their work ethic was amazing unbelievably they asked to stop for a bite to eat. Would recommend this company to everybody no matter how big the move. 100% perfect. Brilliant service, very good price, friendly and knowledgeable staff, gave great advice prior to the move and were brilliant on my moving day. I would highly recommend London Removals. Excellent company from start to finish - the guys on the day went the extra mile and were really careful with our stuff. I highly recommend. Fantastic team that did an incredibly efficient and professional job. I can't recommend these guys enough. They arrived promptly, got on with the job quickly, took a great deal of care with our belongings. The team was fantastic, very good professionals. We had a few problems that weren't London Removals fault. The team was professional, courteous and careful throughout. I couldn't have been happier with their service, and it was the best value quote. On time - early in fact. And no damage to property or furniture. What a gold standard company compared to others I’ve used. Highly recommended. These are the best removal company around - reliable, fast, honest and careful. A real pleasure to deal with from office staff to the team on the ground. We have used them many times and will continue to recommend them. London Removals is an outstanding removals company that performs its duties with care, diligence and customer service that is second to none. 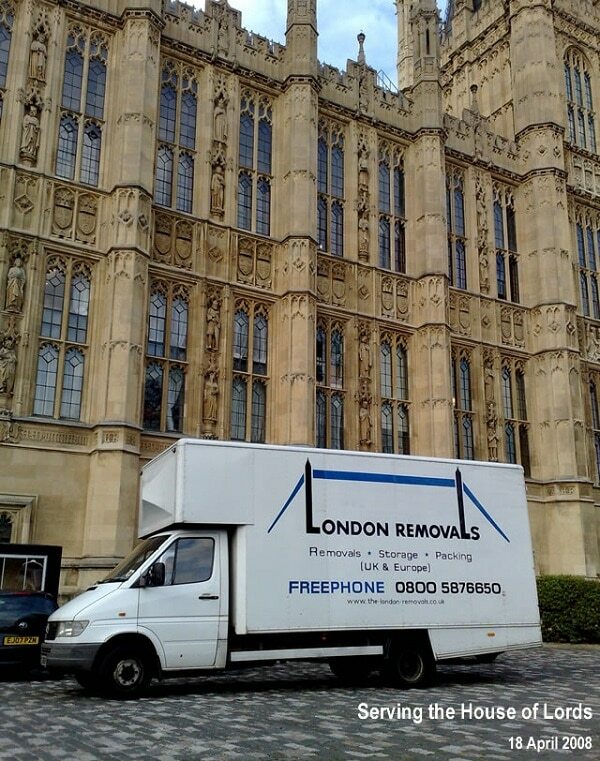 I initially contacted London Removals to obtain an indicative price for moving from London to Scotland. I was given a very competitive price for the work so much so that when I was ready to proceed with instructions, I contacted London Removals again to make the arrangements. I was later visited by an estimator who confirmed the price previously quoted. The removal men turned up one hour earlier than arranged on the day of my move and had my home packed up in around four and a half hours.They even attended to dismantling my dining table and a bespoke sofa. They arrived at my new address in Scotland the next morning at the time that we agreed; they re-assembled my sofa and dining table. They unloaded all of the packing boxes very efficiently. Nothing was broken. The van with my home packed up in it was stabled overnight in a specialist security compound so that the removal men could sleep in a hotel. I recommend this firm without the slightest hesitation as a competent and economic option when moving home. Excellent service from the team. I had to put my belongings in storage short term also and this was managed easily and well with little stress on me!! The prices are competitive and communication was open. Would definitely use London removals again! Thank you! TWO YEARS I've used this company. They moved me seamlessly from South London to North London and 11 flights of stairs. They packed for me (and well) kept me in the loop on arrival and made moving so easy. I relocated to Canada and they stored all of my goods for me in a secure, dry and controlled environment. I know this because I chose to stay in Canada and had them work with my friends in the UK who sold it from storage in pristine condition. Nothing was a bother to them and I had responses to me emails and questions in 24 hours. They are not the cheapest for storage, but if you want to be able to have human contact from removal, delivery, storage and accounts then this is the place for you. I could not have done without them and 100% I'll be using them again when I return back to the UK. Honest, reliable and efficient! Professional and competitive company. We had to change plan a bit regarding the move as our elevator broke a day before the move. They were very accommodating and recommend us different options. The movers were great: fast, efficient and very careful with our furniture. I would highly recommend this moving company to anyone. We have used London Removals UK Ltd for both residential and commercial moves and have to say they have always performed beyond expectations. We will definitely continue to use them for any future work we need. Their removal staff are professional, friendly and very hard working and no matter what the job has been they have provided a level of service that is second to none. The office guys are also fantastic making sure all our requests are dealt with quickly and efficiently. Could not recommend more highly. Great guys to work with, always punctual, willing to be flexible and have helped us out in a lot of sticky situations. We have worked with London removals on over 10 projects across 3 years and always been extremely impressed. They really do make the moving process less stressful. Thank again! Couldn't have done it all without you. No sensible person "elects"to move.the stress and pain make one really feel like never again. However these guys from fist contact made us feel like we could make it through the experience. The quotation was more than competitive, with a breakdown of all the costings, then the day before a pair of such professional chaps turned up, packing with real care, but also with true speed. The following day moving day five men turned up punctually and eager! The house was on four floors, they moved up and down the stairs like it was two floors.the loading into the vans was genius all the space used and filled, also everything tied securely and level. At the other end a similar event.all the labeling from their packing allowing the boxes to go to their destination rooms without fret. A dedicated member of the team assembled the furniture he had disassembled at our previous home without any issues. London removals, thank you so much. Have used this company for several moves and storage and would definitely recommend them. Very competitive pricing and excellent service from all the staff. I had the pleasure of hiring London Removals for a recent move of mine. They are brilliant, professional, hard working and fast. Everything you expect from a top-notch removals service. I would recommend. Amazing company! Called them same day early morning and they were available to do urgent move, pick up and storage! Prices are also very reasonable and the staff are very personable, particularly Kino and Oleg! Great experience to deal with them, definitely recommended. The services provided by London Removals have surpassed our expectations. Their friendly team are very courteous, experienced and always accommodate our requests in the best and most efficient manner. In comparison to other companies we have also found them to be very reasonable. We are very happy and satisfied with their services and would certainly recommend them to other companies. Mr Jussi Lahtinen, Director of International Sales Testure Finland Ltd.
London Removals were recommended by a friend. Our previous experiences with a number of different removal companies (some reasonably priced and some very expensive) were mediocre, but always there were problems. The service we have had from London-Removals has been, throughout outstanding. They arrive on time; their packing service was very professional, fast and effective and carried out with respect towards our possessions. They have stored our possessions securely and in excellent fit for purpose surroundings. Every time we have contacted them for help, they have been speedy in their response and effective with their advice. You couldn’t have done a better job! The move was well organised and efficient and the staff all very friendly and helpful. We have been a customer for years and can only recommend the firm and the team. The customer service is very good, actual people answering the phone and the support is excellent. Absolutely top service very reasonably priced. Your man was very helpful and did a lot of hard work. I wouldn’t hesitate to recommend you. Well done sir. No doubt we will continue to use you in the future. I will gladly use your services in the future. I will also endeavor to recommend your company to my friends and acquaintances. We would like to take this oportunity in wholeheartedly thanking you, Oleg and all your staff for the smooth transition of moving offices. 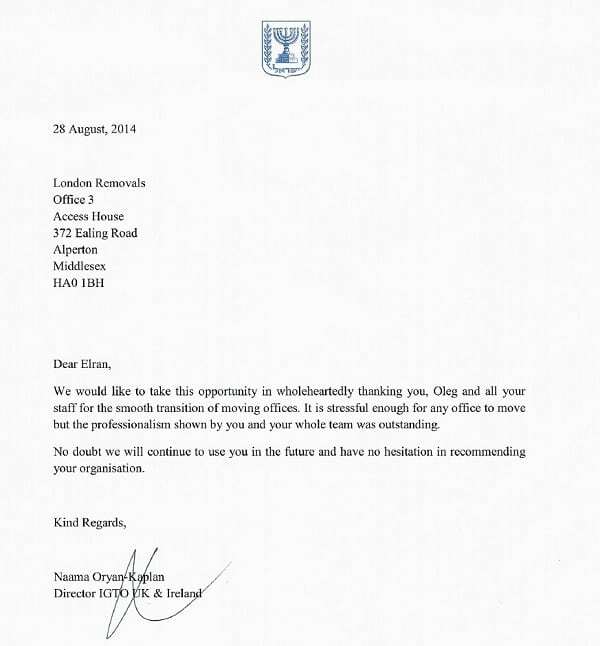 It is stressful enough for any office to move but the professionalism shown by you and your whole team was outstanding.